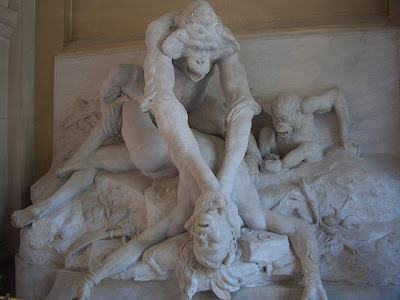 Yesterday I checked out Les galeries de Paléontologie et d'Anatomie comparée (translation probably not necessary: Galleries of Paleontology and Comparative Anatomy) and was immediately blown away by this enormous and shocking sculpture found in the entrance of a mother orangutan strangling a man. I completely neglected to take down the name of the artist and have been unable to find any images or information about this sculpture online. That insane Orangutan Strangling a Borneo Savage  sculpture is by Emmanuel Frémiet, who also did an earlier sculpture of a gorilla abducting a naked white lady which was an inspiration for King Kong. 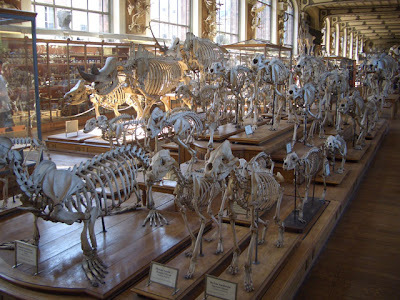 I was already agog as I paid my ticket and continued to be blown away by the parade of ghostly skeletons crammed into a long, suitably dilapidated and crumbling gallery.